Woe be unto the films that are not The Passion of The Christ this weekend, for they have fallen victim to the demon known as Publicity Saturation. The Passion is joined by three other films for the weekend release, but they'll find it difficult to even get noticed amid the hoopla. Combine that with the Oscar ceremonies on Sunday, and it could be a long weekend indeed. Based on Wednesday's numbers and some early Thursday estimates, it's clear now that The Passion of the Christ phenomenon is bigger than anyone could have predicted, including me. I thought I was one of the optimistic ones with regards to its potential, but even I have fallen well short in my estimates. With its record-breaking opening day, the talk is definitely still focused on The Passion of the Christ. It's an easy pick for first place for the weekend after a $23 million Wednesday figure. Given the uniqueness of the film and its circumstances, that still tells us almost nothing about its weekend figure except that it's going to be a success. In addition to the unbalanced weekend due to increased Sunday screenings, we don't know how much of the rush has been dragged away from the weekend by Wednesday and Thursday's screenings (in addition to the super advance screenings on Monday and Tuesday). On the other hand, it could also just sell out through the weekend. In any case, it's all coming up great for Mel so far. I'm increasing my weekend prediction to $47 million, but I won't be surprised to see a very different number from that in either direction after Sunday. Which brings us to the question of everything else this weekend. Direct competition between The Passion and anything else should be minimal; we're talking about a group of filmgoers that most definitely have a film in mind when they're going to the cinema. Instead, the problem for other films would be simply getting face time. There has been so much coverage given to The Passion of the Christ that there simply hasn't been room to cover anything else. For returning films this isn't as much of a problem; they're already out there and into the court of word-of-mouth. For the three other new films, this could prove to be a big problem and getting off the block won't be easy. Twisted has the highest pedigree of them, starring as it does star Ashley Judd, Samuel L. Jackson and Andy Garcia. It's at best, a very generic-looking thriller in the vein of things we've seen from Judd and others many times before. A San Francisco detective, Judd is on the trail of a killer who seems to be targeting those close to her and in addition, suspicion also falls on her. In fact, this looks a lot like Denzel Washington's flop from last year, Out of Time. It's banking a lot on star power when this looks like it would be a direct-to-video release without big paycheck stars. Judd's done well in the past in these kind of roles but her last thriller role in High Crimes opened to a figure that doesn't have to fall much to be a disaster (just $14 million). It's also getting a critical thrashing; it's shooting for a goose-egg at Rotten Tomatoes, a rarity for such a big budget studio film. They can almost always find someone willing to go to bat for them for a favorable pull-quote. Opening on 2,703 screens, it's set for a miserable weekend, with my prediction being just $8 million. Comedy troupe films are always a bit of a gamble; what works in sketches often doesn't translate to a coherent plot. Broken Lizard seems to be able to avoid this fault, having produced the brilliant if not-that-widely-seen Super Troopers two years ago. 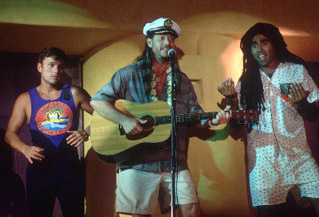 They're back this weekend with Club Dread, a horror-spoof set on a Club Med-like island that perhaps has the misfortune of coming out several years into the horror-spoof phase after Scream and Scary Movie have taken a lot of the punch out of some of the jokes. Broken Lizard's skill lies more in the way it can create jokes from its characters, though, so the horror element may not be as important. They added Bill Paxton as a Jimmy Buffet-like character, who looks to be having a blast, but that's probably not going to make a difference long run. Super Troopers opened to just over $7 million in a similar time of year on a similar number of screens, so the prospects for this film will depend a lot on whether it's picked up viewers on video. The commercials aren't doing much for it; then again, Super Troopers' trailers and commercials weren't very good either. Look for $7 million for the weekend. OK, who is it that asked for a sequel -- sorry, a re-telling -- of Dirty Dancing? They're not even hiding that it's pretty much the same exact story, except this time set in Havana during Castro's rise to power (tonight we dance, tomorrow, ¡Revolucion!). Patrick Swayze even makes a cameo, though his overnight (in the film's universe) aging of 17 years is most likely not explained. It's a fresh-faced cast that I'm sure are trying their hardest, but this is facile stuff and it's not like we don't have the original to watch. We just don't need this film. Dancing movies have performed moderately well in recent months but those have been hip-hop based movies like Honey or You Got Served. This should be more like Center Stage from four years ago, which failed to break $20 million total. It's trading on name brand alone, which is no guarantee of anything. I predict $6 million for the weekend. Fighting above this fray is 50 First Dates, which is proving to be yet another of Adam Sandler's hits. The 50% fall from week one to week two looks steep until you realize that a lot of that was due to the absence of a Valentine's Day effect last frame. It should return to a more normal drop-off pattern this weekend, earning around $14 million, and getting to about the $90 million mark. Confessions of a Teenage Drama Queen was a surprise second place last weekend, proving that Lindsay Lohan may have a career just yet, even if the film did only open to around $9 million. It's getting a strong secondary push and might have what it takes to stick around for a few weeks, like her Freaky Friday last year. A moderate drop off to $5-6 million should be in the cards. The inspirational hockey film Miracle is chugging along nicely, with over $50 million already under its belt. Disney's proving to be the expert at these kind of low-key true-to-life stories so we can probably expect to see a lot more of them. Miracle should bring in another $5 million over this weekend. The three new films from last week other than Confessions look dead on arrival. Welcome to Mooseport, Eurotrip and Against the Ropes all failed to impress and didn't reach a critical mass that would be necessary to propel them. Eurotrip probably received the best word-of-mouth but belongs to a typically short legged genre. They'll all do well to hold on to 50% of their business from last week. Barring a wide scale total collapse of the new releases (which certainly is possible), there will be no Oscar nominated films in the top ten. Mystic River has done the best job at hanging on, earning between $3 and 5 million each weekend for the past five weeks and adding $25 million to its total. The chilling revenge drama is a strong candidate for multiple awards (including two of the four acting categories), which could keep it going for several weeks afterward if successful. The other films that are likely to get box office help from this weekend's results are The Lord of the Rings; The Return of the King, Monster and Lost in Translation (still holding on even after its DVD release).